Lawn Bowls, including Para Bowls, is to remain a compulsory sport in the Commonwealth Games up to and including the 2030 Games. Glasgow 2014 was one of the most success Lawn Bowls medal hauls for Scotland, where the hosts won gold in the singles, pairs and fours. "It is fantastic news," said Bowls Scotland High Performance manager Rhona Howie. "That confirmation makes a difference when driving performance forward." 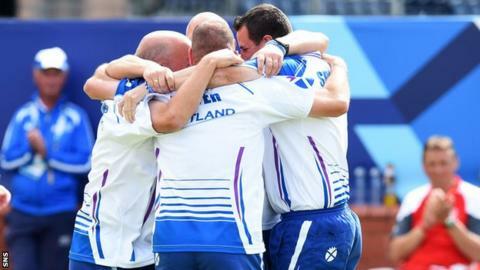 Team Scotland were also successful at Glasgow 2014 in the Para Bowls, winning silver in the mixed para-sport pairs. "I was in Nottingham as Scottish team manager for a test series against Disability Bowls England when the news was announced. There was a cheer raised throughout the stadium," said one of the silver winning medallists Ron McArthur. "Glasgow 2014 demonstrated the best of Para Bowls and I am sure it was a contributing factor in the decision to include it until 2030. "In Scotland we can be proud of our disability bowlers and this news will be a fantastic boost to their confidence and a terrific reward for their dedication to the sport." Bowls is one of 16 Compulsory Sports which will now feature in the Games from 2022 to 2030. The Federation also listed Para Lawn Bowls as one of only four sports for disabled people that must be included - alongside Para Swimming, Para Athletics and Para Powerlifting. The next Commonwealth Games will be held on the Gold Coast in Australia in 2018, with the 2022 event being hosted in Durban, South Africa.